Silver Lattice Guest House is a highly recommended property providing self catering in Gardens for tourists visiting the City Bowl region. 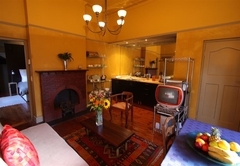 Silver Lattice is a newly restored Cape Town Guest House, centrally situated in the historical heart of Cape Town, close to the famous "Company Gardens". Whether you're enjoying the refreshing contemporary interior, relaxing in the wind-protected garden, or wandering through the characteristic historical neighbourhood, the experience promises to be sensual and satisfying. 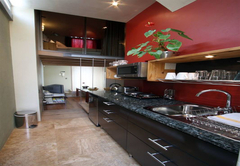 Silver Lattice offers three apartments that are fully self-catering but serviced. An optional breakfast basket can be included at cost price, consisting of fresh croissants, muffins, breakfast cereal, yoghurt, and fresh fruit - to be arranged before. Standard items like filter coffee, tea, sugar and milk are always supplied. Quality ‘Plasma’ air conditioning units have just been installed in Unit 1 and Unit 2. Unit 1 has its own lock-up garage, with remote controlled doors and direct access into the unit. 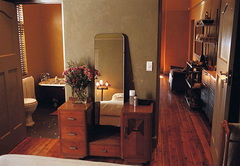 A comfortable bedroom and en-suite bathroom with bed linen and towels. Separate beach towels are provided. Kitchenette with fridge / freezer, two plate cooker and a convection/ microwave oven and griller, toaster, kettle, crockery, cutlery, own washing machine and tumble dryer. 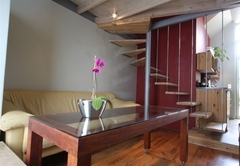 The lounge has a comfortable sleeper coach and is equipped with a television (with DSTV) and DVD player and opens onto a veranda /timber deck /barbeque facilities in garden with views of Table Mountain. We also offer pre-paid telephone service and ADSL (broadband) "hotspot" for your own notebook at no extra cost. All the units are non- smoking, but there is a veranda for you to smoke. Unit 2 offers the same as Unit 1 with the following differences. The bedroom is bigger with one king size bed or two single beds. This unit does not have a garage but parking in the street is not a problem. Unit 3 also offers the same as Unit 1 with the following differences. This unit has two bedrooms each with separate air conditioning units (one with king size or two single beds and the other bedroom with two single beds). This apartment has its own lock-up garage with remote controlled door. This unit does not have its own outside terrace. 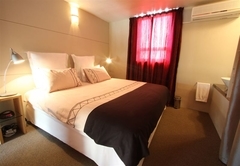 Silver Lattice Guest House is ideally situated to take advantage of Cape Town's vibrant night and day life. 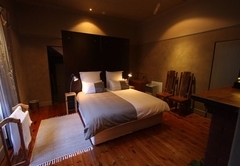 Within a short walk from your doorstep are a wide range of conveniences and attractions: Excellent restaurants, cafe's and bars including those on historic Dunckley Square; The up-market Gardens Shopping Centre offering many conveniences; A 10 minute walk to the popular Long Street night life and trendy restaurants in Kloof Street; Only a 15 minute walk through the historical Company Gardens to famous Greenmarket Square in the City Centre. By car it is an 8 minute drive to the well-renowned Victoria & Alfred Waterfront or the Table Mountain Cableway and a 10 minute drive to well known Cape Town beaches like Clifton and Camps Bay. This central location is easy and convenient to find from the Airport and makes it ideal for several day trips, like the Fishing Village and Bird Sanctuary of Hout Bay; the wine farms in Constantia; the National Botanical Gardens in Kirstenbosch; and many others. A comfortable bedroom and en-suite bathroom with bed linen and towels. Two bedrooms, one with king size or two single beds and the other bedroom with two single beds. HARD TO BELIEVE BUT WE HAVE STAYED WITH NICO 6 TIMES AND AS ALWAYS IT WAS THE ONLY PLACE TO STAY IN CAPETOWN. Now for our 5th stay with Nico and the Silver Lattice. Words can not describe the facility, location and Nico. Already planning our next trip in 2016. 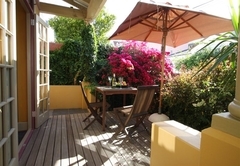 Fantastic place and the only place to stay in Cape Town.